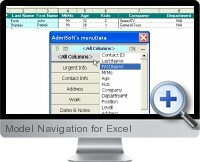 Model Navigation for Excel enables the management of Excel data columns much more efficiently. Through a fully customizable menu for each worksheet, columns can be hidden and unhidden by categories to present only the data required in order to update it, read it or to analyze it. Columns can be organized under categories (buttons of the menu). Navigate instantly from a selection of columns to another selection of columns. Able to select and view non-contiguous columns (for updating, reading, or analyzing needs). If you manage data sheets within your Excel models often, Model Navigation for Excel can save you a considerable amount of time.